It is our immense pleasure to introduce you to an incredible arts educator, Para Perry, and parent extraordinaire, Willem Dicke! Ms. Perry is the music teacher at Amidon-Bowen Elementary School in Southwest Washington, D.C. and Mr. Dicke is a parent volunteer. The dynamic duo has collaborated on several projects to help the arts come alive for students and the entire school community. 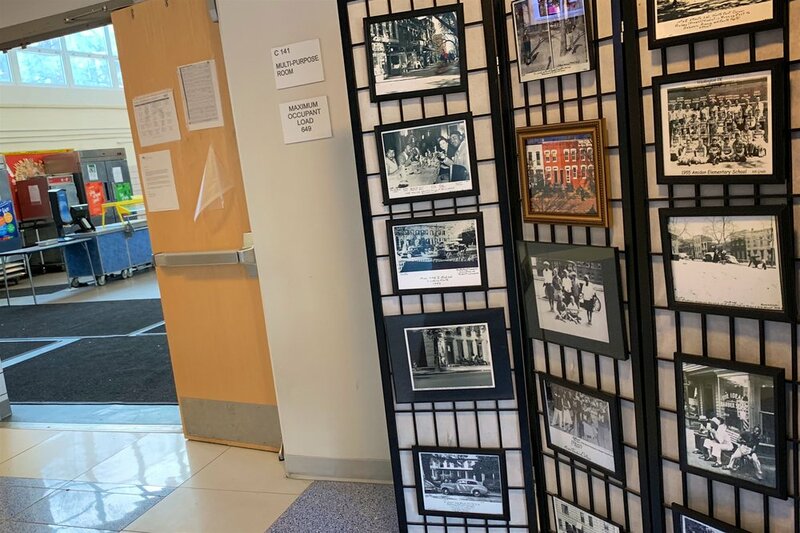 In celebration of Black History Month, they have recently teamed up again to create an incredible photography exhibit at their school. We were lucky enough to have the opportunity to ask them a few questions about their inspiration for the project, remarkable collaboration and the amazing ways in which they are working together to engage students in the arts. Keep reading to learn more about their important and inspiring project! The project has two intertwining purposes: the first of these is to showcase the result of the work of the students who made up part of our photography group CamShake, in which we attempted to teach the students not just the technical fundamentals of photography but to demonstrate how photography as an art is a powerful means of self-expression, a way of commenting on and documenting the world around them. It is the camera’s power as an instrument of documentation that ties it to the project’s second purpose: the showcasing of Joseph Owen Curtis during Black History Month. social, cultural and architectural history of a largely African-American middle class that existed at the time. With its physical structures razed and its inhabitants dispersed, Curtis’ photos are a testament to a history that has been largely forgotten, and stand as a powerful refutation to the dominant historical narrative of the area as a “slum” or “shantytown” still peddled by the city’s newspapers, its own promotional materials, and even among those who argue for the historic preservation of parts of the quadrant. While there is universal condemnation of urban renewal as both a moral and practical failure, the subtext is that the “blighted” old Southwest was not really worth saving anyway. Beyond the technical and artistic aspects of photography, it is therefore the intent to show the students, many of whom come from families with roots in Southwest DC that stretch back for generations, that their community has a proud and rich history that has essentially been forgotten. 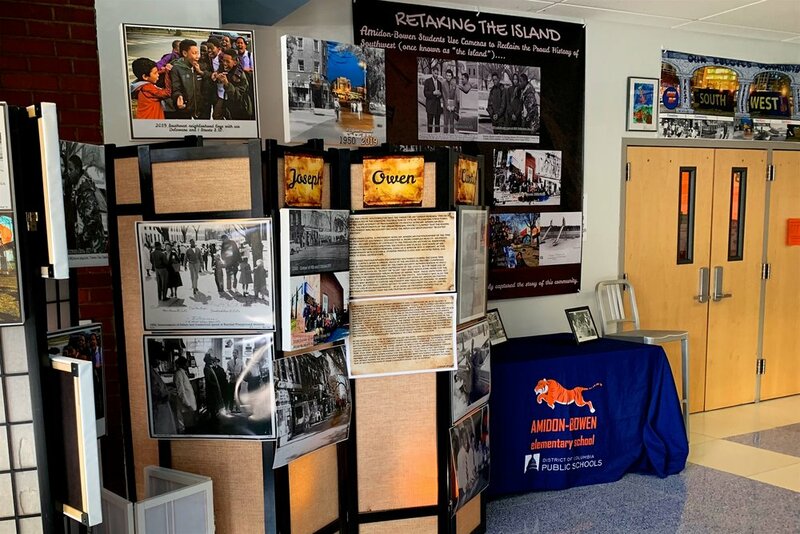 By going out and photographing the exact sites that Mr. Curtis did they are reclaiming that history on behalf of their community and empowering themselves by becoming-- as our 3rdgrade teacher and DC Teacher of the Year Ms. Harper would describe them—change agents. If they are to be exhorted to “not let your zip code be your destiny,” as I heard when I attended the 5thgrade commencement last year, then they also deserve to know that their zip code was, for decades, a destiny itself, and a desirable one at that. As a Southwest resident for ten years and as the father of a daughter who will be from Southwest DC, I too have a stake in the accurate historic portrayal of our community. Curtis had the extraordinary foresight to write very specific notes at the bottom of his photos as to who was in them and, more importantly, where they were taken, which allowed Ms. Perry and me to take the students to the exact locations. The students did not just recreate the shots but did a terrific job of reinterpreting them according to their own instincts and visions. Willem Dicke: The project initially grew out of Ms. Perry’s and my desire to harness the ability and enthusiasm for photography shown by Amidon-Bowen students at the holiday program Ms. Perry organized last December. I was taking pictures of the students’ performances with my professional camera when one of the students asked if he could borrow the camera. It was the most expensive camera I own with a heavy lens attached to it, but I thought I’d throw caution to the wind and see what the kids could come up with. I gave some of them some of them about a minute’s worth of instruction on operating the camera, and before I knew it I was surrounded by kids wanting to take pictures. Before long there were two professional cameras, a GoPro and and iPhoneX circulating among the students. When I transferred the photos onto my laptop when I got home I was stunned by the quality of some of the photos, to the point where I wasn’t sure if it had been me or a student who had taken some of them. Two weeks later, I stumbled upon a collection of Joseph Curtis’ photographs in the basement of the church located across the street from the school. Since our time working together to produce the school video, Ms. Perry and I have discussed offering a music technology class to the students once a week that would encompass music and video production along with photography. The Curtis photos with their analog GPS data gave us both a framework and a syllabus to help us fulfill the photography part of this goal. No small amount of thought was given to the question as to whether an elementary school was the proper place for a project to resuscitate an endangered photographer, but ultimately the words of one of the 5thgraders describing how his great aunt still remembered the old Southwest and that she hoped the community she knew would be remembered, along with the message of our DC Teacher of the Year, Ms. Kelly Harper, encouraging her students to be change agents held sway. 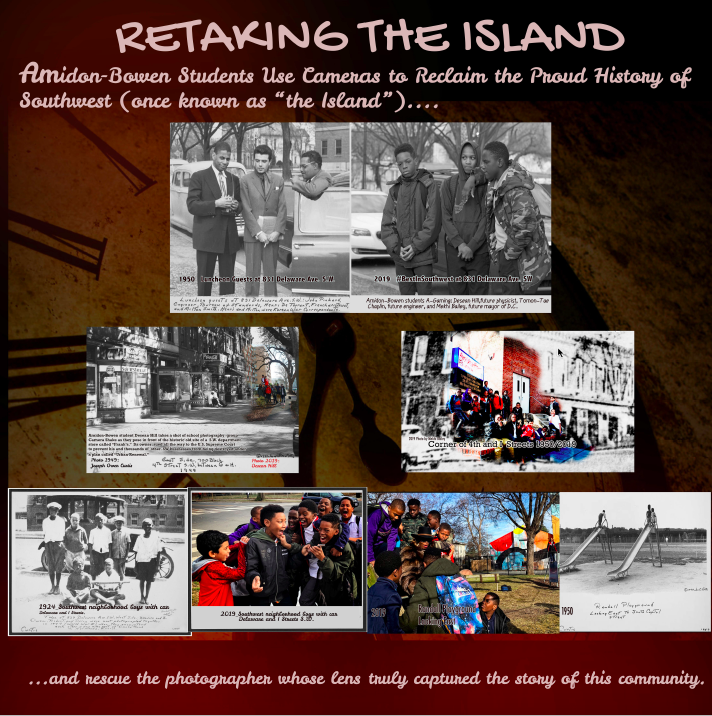 Because who better than a group of fifth graders and their teacher to “take back the island” by taking back Southwest’s historical narrative and in so doing righting a historical wrong visited upon their own community? Ms. Perry and I have discussed the possibility of starting a Facebook page to house not just the public domain photos of Joseph Curtis, but to have the relatives of the students who are longtime Southwest residents send their photos into the school to Ms. Perry’s classroom, where I would show the students how to scan photos and subsequently preserve them for posterity. What do you want students to learn from this project? Para Perry: Students will know that the past is important but the present is even more important because they are creating it. This will give students a better awareness of how things were and how quickly things can change. Students will develop an appreciation for their community both past and present. Willem Dicke: First and foremost, this project aims to teach students about photography. As an artistic means of expression or as was the case with Curtis, a tool for documenting his community. With the quality of cell phones cameras starting to challenge the quality of cameras aimed at professionals, learning just a few basic things about photography will help them take better pictures. And because those phones are also platforms through which they can reach wide audiences, how they represent themselves and their friends is important, not just because they’ll obtain more followers on Instagram but also because social media is increasingly being scrutinized by schools and businesses to assess applicants. Hopefully, the Curtis exhibit will show that they are part of a historical continuum, and that 50 years from now the spots they captured with their photos will seem as distant as the scenes in the Curtis photos now seem to them. Describe your parent/teacher collaboration on this project. Willem Dicke: Ms. Perry and I have been working together for over a year and half on projects that have included a school video, an Aretha Franklin tribute video, and a tribute to our DC Teacher of the Year, Ms. Kelly Harper. Ms. Perry herself has been an enormous inspiration to me. She’s not just an excellent music teacher, she also teaches life, love, respect for self and others, and above all “A-game”—or as she describes it in the lyrics to the school song that she wrote “You Gave Me Your Best/Never Settle for Less.” When she came to me with the idea of the school video—which would require an almost unheard of five-week schedule, the audio and video recording of her choir, countless hours of editing and then photographing every class in the school, since we both agreed that whatever we did together would benefit the ENTIRE school—she did not approach me with a privilege argument. She appealed to my sense of justice and fairness. She said, “Will, these kids deserve to have a school video just like their peers in more affluent zip codes.” And before she had uttered her second sentence I had my sword drawn, ready to charge at her command against the forces of tyranny and oppression! And, so, I agreed to do something on a scale and within a time period that all my previous experience as a musician, music /video producer and photographer said was impossible, but we got it done! It takes a hustler to know one, and Ms. Perry has challenged me in a way that I never have been because as a hustler, an A-gamer, she is like the musician in a band who is better than I am and as a result I have had to up my own game to stay even remotely close to her. In trying to describe her, I have been able to develop a vocabulary and a vision with which I aim to raise my daughter and a standard that I feel I have to meet. Without a hint of exaggeration, I can emphatically say that as a result, I have become a better husband and father and a more knowledgeable person in general. She is the backbone of the school and despite all of the time I have dedicated to Amidon-Bowen, I feel that this photography project and all the projects that come after I will be doing with a credit line the school has extended me. She and her students have taught me so much more than I have them. Para Perry: Mr. Dicke has been a blessing to our school family and me. There have been so many things I have wanted to do with technology but needed two more hands, he has been four more hands. He is one of the most creative people I have ever met. He’s full of ideas! I am blessed to have him as a collaborating parent partner. I call him my partner in crime; it’s all about the kids and families we serve. He loves our students, our school and the SW community. He has inspired me to do even more for our students and the SW community. How does arts education impact the Amidon-Bowen school community? Para Perry: The arts bring us together academically as well as socially as a school family. All of our students are performers in every way you can think of from Pre-Kindergarten through 5thgrade. I always say that the arts make both sides of the brain work, therefore we have brilliant students at Amidon-Bowen. How has arts education impacted each of you? Para Perry: When I was a young child in junior high school I joined the school chorus, it was at that time I realized that I wanted to be a choral music teacher. Through music I have had many experiences. I have performed in the presence of three U.S. Presidents and traveled abroad. I want my kids to know that the arts can give them opportunities beyond their wildest dreams. Music is my life at home, work and church. Willem Dicke: I never had any formal arts training, but I wish I had had an arts teacher like Ms. Perry for all the reasons I mentioned, but also because it would have made learning the guitar, piano and a few other instruments I play a lot easier. Learning the basics of music theory is now more important than ever, since so many artists are now their own producers and the key to being able to use, say, pitch correction software demands that type of knowledge.